An enhanced Memory form that incorporates new features and supports the new FM Repeater mode of operation is available with PowerSDR v2.1.5. The new Memory form (or window) is designed primarily for FM mode, but can be used with any mode. A representative screen shot of a populated Memory form is shown below. As you see, each memory form record consists of different data fields. The table below describes each memory channel field in the memory channel entry. put into SIMPLEX mode. 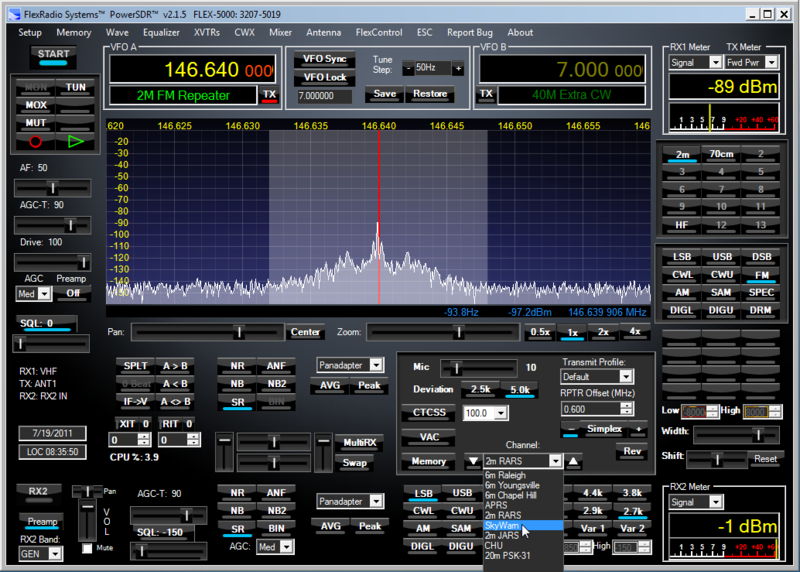 Refer to the KB article How to Use FM Repeater Mode for additional information. TX Frequency This defines the transmit frequency. It is a user defined value that is valid only in the simplex mode of operation. To open the Memory form, select Memory from the PowerSDR menu bar. There are several operations that can be performed to add, delete, manage and select a memory (or memory channel). The following sections will describe these operations in greater detail. Adding a memory channel to the Memory database is easy. It will take the currently configured parameters on the PowerSDR console and store them as a memory channel "record" that can be recalled later. A new memory channel will be added to the memory form at the bottom. Once you have created a memory channel using the ADD feature, you can recall or Select the memory channel which is change the PowerSDR operating mode to the parameters defined in the memory channel. There are two ways to select a memory channel from the Memory database. You can select the memory channel directly from the Memory form or you can select the memory channel from the PowerSDR console when operating in FM mode. This example selects the memory channel from the Memory form. As noted above, there are two ways to select a memory channel. The following example demonstrates the second way of selecting a memory channel by using the option in the PowerSDR console when operating in FM mode. A listing of all memory channels will be displayed (see screenshot below). Left click on the memory of your choice. In the example below the SkyWarn memory channel is being selected. If you want to make a copy of an existing memory channel to use as a starting point or template for creating a new memory channel, you do this by executing the following procedure. Using your mouse, left click on the far left hand side of the memory channel you want to use as the source information. The memory record will highlight and there will be a right pointing triangle in the far left hand side indicating that the memory channel has been selected. At this point you can change values in the new memory channel to create a new unique memory channel. Changes you make to the memory channel record are automatically saved to the database so there is no need to do anything to save the changes. You can change the sort order of the memory channels by simply clicking on the column header. Left clicking on the memory column header once will display a small upward pointing triangle indicating that the column is sorted in ascending order from top to bottom. Left clicking on the column header again will display a small downward pointing triangle indicating that the column is sorted in descending order from top to bottom. You can delete unwanted or un-needed memory channels by using the Delete feature in the Memory form. Using your mouse, left click on the far left hand side of the memory channel you want to delete. The memory record will highlight and there will be a right pointing triangle in the far left hand side indicating that the memory channel has been selected. If you clicked YES, the memory channel was removed from the Memory database. Once you have a memory channel defined, you can change any of the data fields on the memory channel record. Note that if you change the value of one field, that it does not necessarily update other fields in the memory channel record. As an example, if you change from Simplex to Repeater mode with a positive 0.600 MHz offset, the TX Frequency is not updated to reflect a TX frequency that is 0.600 MHz greater than the RX Frequency. Article has been viewed 15,891 times. Execution: 1.047. 13 queries. Compression Disabled.